Well, it has still been a roller-coaster rides for both Bonnae and myself, but I am delighted to announce that Bonnae gave birth to a beautiful baby girl! I was told it was a hard and complicated labor, but both I am happy to report that both are well and healthy. Congratulations, Bonnae! In my household, my little JP has grown to be a healthy little baby, who has becoming quite an entertainment for all of us with all of his quirks and his toothless smiles. My now-grown RJ, my own little chatterbox and jukebox, likes to just follow what you're doing with constant questions of "Why?!" In the middle of that hustles and bustles, I managed to "sit down" and be in my own world of cake decorating. I learned through some books and online video tutorials of how to make sugar flowers after the boys are all asleep. 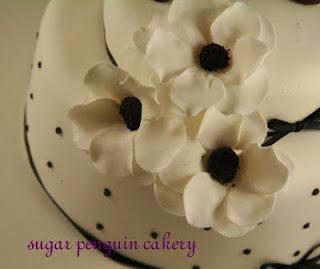 I adore Jacqueline Butler works (Petalsweet Cakes), her flowers are amazing, very life-like and beautifully arranged! 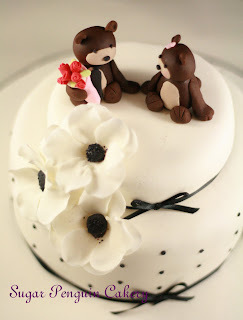 This cake was made for a good friend of mine, WP, for his special someone in his life. We made a cake for her last year, the one with the piano. This cake was inspired by one of my cake hero, Peggy Porschen.